Everything you need to know about Caesar and the gang in one easy click. Does the Planet of the Apes franchise seem as impenetrable as a fortified Ape City on the eve of a mutant doomsday attack? Don't know your Corneliuses from your Doctor Zaiuses? Do you hate every ape you see, from chimpan-A to chimpan-Z? 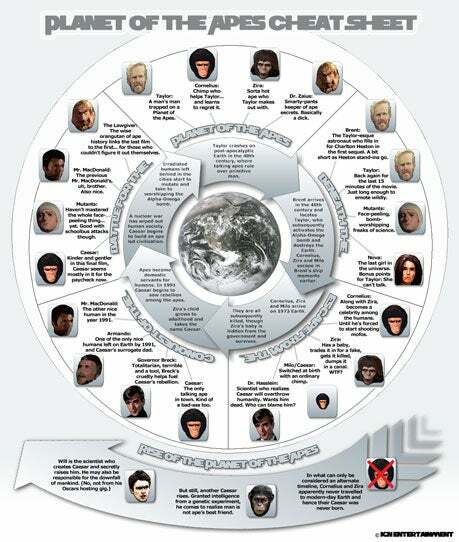 Well don't worry, because we've got you covered with our handy Planet of the Apes infographic cheat sheet! With Rise of the Planet of the Apes hitting theaters this Friday, we figured it was time for a little tutorial. The infographic traces all five original movies with an easy to understand timeline, from the original Charlton Heston classic to the mutants of Beneath, through the adventures of Cornelius and Zira in Escape to Caesar's rebellion in Conquest and, of course, the cheesy final chapter of Battle… Well, the final chapter until the new Caesar arrives this weekend and (hopefully) spawns a whole new franchise. And as for the Tim Burton film, its importance to Apes lore is indicated by the amount of space it got in the graphic (read: none).